For uploading, transferring PDF files easily, sometime we need to compress PDF. Normally speaking, compressing PDF can help you optimize PDF structures and compresses pictures, graphics and objects within a PDF file while preserving the original file format and quality. In the following part, I will show you how to compress PDF under Mac system by GUI version software. The software I will use is VeryPDF PDF Compressor for Mac, which also can help you set PDF description such as Title, Subject, Keywords, etc. Please check more information on homepage, in the following part, let us check how to use this software. This is GUI version software, when downloading finishes, there will be a PKG file in downloading folder. Please install this software by double clicking the PKG file. When installation finishes, there will be message reminding you that installation successful. Please go to Finder then Application, you can find PDF Compressor application. The following snapshot is from the software interface, please have a check. Step 2. Compress PDF under Mac system. Please click button Add to add PDF file to software interface in batch. When adding finishes, added PDF will be shown on software interface with detail file path and file size. By this function, you will not mistake one for another when compress PDF in batch. Then click folder icon to choose output folder. Click button Options to do setting part. The following snapshot is from the setting menu option, please have a check. There are four tabs of this menu option: Image tab, Fonts tab, Security tab and Description tab. The following snapshot is from the Images tab. 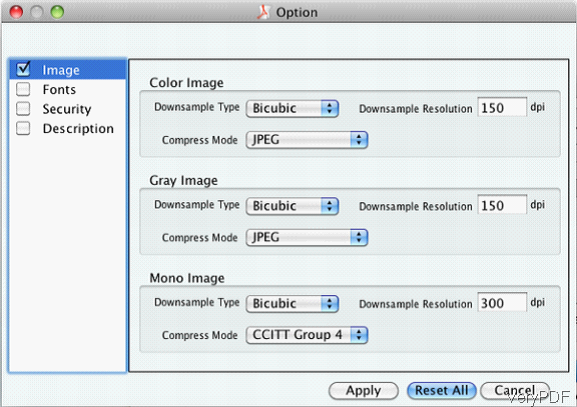 This tab allows you to compress PDF image from three different kinds: color image, gray image and mono image. And under each single type, there are three compression methods, you can compress image through down sample type, download resolution and choose compression modes. By this method, compression effect can be optimized to the best. Meanwhile in the font tab, you can compress font by embedding, in the security tab, we can set password to protect output compressed PDF file. In the Description tab, we can add basic information to compressed PDF and convert PDF to PDF/A. When you finish setting part, please click button Apply to back to the main interface. In the main interface, please click button Start to run the conversion. A few seconds later, we can find the output PDF file specified output folder. By this software, we can compress PDF under Mac system quite easily. During the using, if you have any question, please contact us as soon as possible. This entry was posted in Software for Mac and tagged compress PDF. Bookmark the permalink.